To say we're excited to be part of this would be an understatement. 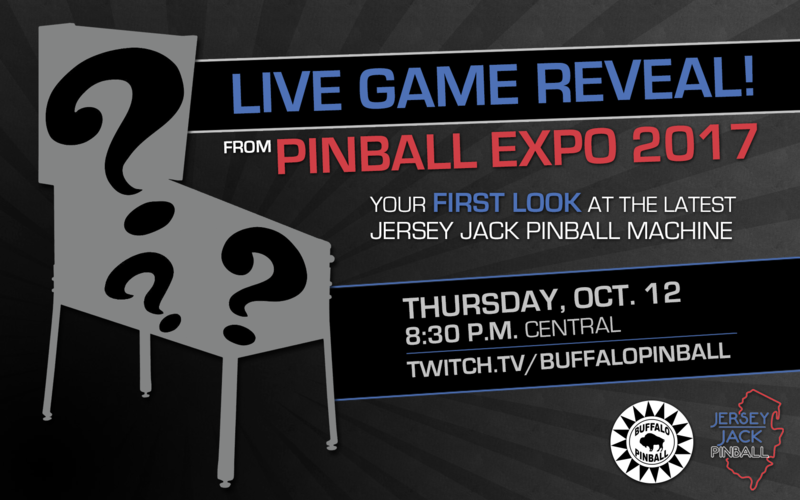 gusphan and I have the honor of streaming the reveal of Jersey Jack Pinball's latest game live from Pinball Expo 2017! Tune in to http://www.twitch.tv/buffalopinball at 8:30 p.m. Central on Thursday, Oct. 12 to see the first gameplay of JJP #4. Hopefully JJP has learned from last year. Im not talking streaming quality either. Im talking presentation and showmanship. A little pizzaz couldnt hurt. Tell me this, will Johnny Depp be there, or Tom Hanks? Shouldn't the date be the 19th? no, expo is the 11th-15th. the date and time are correct. Wednesday, October 11th - Sunday, October 15th 2017. Will the designer be announced also? Eric Meunier has already been announced as the designer. So Kevin...We playing for dollars or beers on this during the reveal? Excited to meet you guys and hang out! Thanks for coming on board for the reveal! What a great Expo. Can't wait to be there. Awesome! Wish I could be there to see the unveil in person but this will be the next best thing. Thank you. Maybe someone should initiate a "Parlay". I'll play for dollars, Nick can play for the beers. Either way: CRAZY! First off, Thank You for doing this live stream for those that couldn't attend the reveal to get to see the latest creation by JJP. Third, I have a couple of DI LE's Available as well as couple of open box show games (Woz, Hobbit) for sale that can be brought to the show if someone is interested. I really hope JJP does competitive pricing and puts the squeeze on Stern on this one. Give me Toy Story so I can get my kids addicted. This is what I was looking for. Thanks for this service guys.